DublinHire.com is constantly working on the quality of its service and, in order to improve it, we obtain opinions and valuable experiences from our dear customers. We do our best for you! Here’s an interview from one of our regular customers – Roman (35, Kiev, Ukraine) – which you may find quite interesting and helpful. Hello, Roman! Thank you for your participation. Tell us about your previous car hire experience. I regularly rent a car when traveling or going to work. I’ve driven across more than 15 countries by rented car. This gives me a unique opportunity to travel and to see all those places which are not normally available for travelers who purchase tours from travel agencies. And also, it’s certainly more convenient, and some time even cheaper, than traveling by public transport. 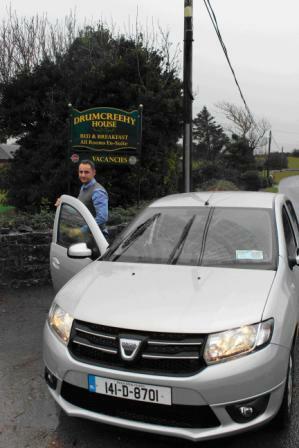 When was the last time you hired a car in Dublin, Ireland? What for? How long did your trip last and with whom did you travel? In Dublin I had to visit my business partners. And also, I would like to see a little bit of Ireland itself. So, me and my brother drove across all the country to the Cliffs of Moher and stopped in Galway. It was fantastic! We planned our route so that we could both do our business and visit new places. What did you enjoy about your ride and what you didn’t? What did you enjoy the most? It was very easy to move around the country by car. Freedom of motion is the best thing that rented car gives! Although, we faced with the parking problem, since it was difficult to figure out where tourists can stop and park. But, eventually, we found parking spaces. It was also unusual that the track is not lighted properly and lanes are narrower than I’m used to. Therefore, when the weather is bad, it is difficult to move around. On the other hand, the roads surface is very good. I have something to compare with. Did you have any problems with hiring a car? If you did, what problems those were and how did you handle them? The problem was with the headlights. We were driving at night and it was not very well seen as headlights were not properly set and it was difficult to set them, even with our driving experience. That’s why we decided next time to check the headlights setting right there at the company we hire from before driving. What tips can you share with other drivers who would like to hire a car in Dublin? What will you advise? It turns out that it’s very important to check all the details at the rental counter and at the car hire park as in some cases you can find out that some things might be out of order. Make sure that those things are documented and the agent knows about them just to protect yourself from unpleasant surprises. And I strongly advise everyone to read the section about terms of hire very attentively. What do you find the most useful on DublinHire.com? For me, the most interesting information is about car hire peculiarities in different countries. For example, in the US you can place up to 4 additional drivers. Ireland also has its own important rental details, like: driver’s age requirements for certain car groups, parking rules in Dublin or some other city, etc.. For instance, if you want to hire SUVs, full-sizes or some luxury cars, you have to at least 28 years old. This information is always available in the terms of lease section of each vehicle separately. As for parking, Dublin is divided into several specific tariff zones and there is also something you will have to pay attention to. And DublinHire.com has all the necessary information on this subject. So, when I’m planning my trip, I try to find out more information about car hire nuances in the location I need. Thank you, Roman, for sharing with us! We wish you and all our drivers the most unforgettable trips!